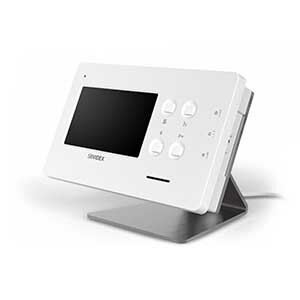 The 4.3” colour LCD screen from Videx enhances our range of colour video monitors which helps to provide access control solutions to residential properties across the UK. Video door entry is becoming an increasingly popular way to manage door entry to and from a property due to the heightened security measures it provides. Currently, the monitors are available for the VX2200 6 wire system, VX2300 2 wire system and video kits enabling these monitors to be used in single apartment systems all the way through to high rise systems with up to 1000 apartments. The monitors are a low profile surface mount finished in an attractive satin white. The low profile design negates the need to flush fit the device and the connections are all plug type for ease of installation reducing installation time enabling further cost savings to be made. The 6400 compliments the existing 6300 series hands free monitors and 6200 series with handset and can be used together on the same system. A stainless steel desk kit (Art.64931) is also available to compliment this range.